The garish interior (with fake Queen Anne chairs upholstered with what looks like satiny pink drapes) might seem kitsch and tiresome. The food, though, is inexpensive and invigorating. You can choose from fish, shrimp, vegetarian and non-vegetarian menus. 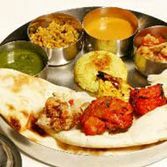 These include an appetizer, soup, a cheese dish, and a main course accompanied by basmati rice or the best naan (Indian bread) in town, wholesome and served straight from the oven. Choose from a wide variety of Indian beers, tea and grappa.